I was very pleased (and a bit relieved) that Simon Donner accepted my offer to pass the Woody Guthrie Award to a Thinking Blogger to him. Simon and I have only met a couple of times, and while we got along nicely, we have very different intellectual styles. I like to speak first and backpedal later, and am happiest when perceived as a bit iconoclastic and dangerous. Simon on the other hand is careful, thoughtful, and spot on pretty much every time, without ever being the least bit dull. Just what you want, really, in an academic or an outreach professional. 1. Climate change is not an “environmental” problem. The non-linear, multi-factorial and time-varying dynamics of the climate system make the problem of climate change radically different from most classic “environmental” problems. As such, we can learn more about how to address climate change from studying other grand societal challenges, like poverty or racism, than other environmental problems. 2. In general, we have a very poor understanding the effect of climate variability, climate events or “shocks”, and climate change on our lives. In the western world, this comes in part from being largely isolated from the everyday reality of weather and climate. It is also comes from wrongly placing different types of climate change impacts (precipitation, sea level rise) and climate change impacts of different regions (droughts in the prairies, droughts in sub-saharan Africa) into separate mental boxes. In an interconnected, globalized world, the rain doesn’t have to stop falling in your neighbourhood for you to be affected. 3. Adapting to climate change is far more difficult and far more expensive than most people and most supposed experts assume. This comes from spending too much time and effort estimating the costs of mitigation here in the developed world, and too little looking the efficacy of local development and especially international development projects. And these are all great topics, and he addresses them well. What he doesn’t explicitly list though, and what draws me to him, is his intercultural empathy. Now it’s true, everyone I know or know of who’s spent time in the South Pacific (possibly excepting Willis Eschenbach, who oddly turns out to have a mutual acquaintance with me), from Simon all the way back to Paul Gauguin, seems very much affected by the culture. But Simon has been known to write about it eloquently in the context of our climate quandary. To be scientific about outreach, you need to be be extremely harsh with yourself about why you are getting engaged beyond the scientific world. I cannot stress this enough, I did not think about this nearly enough before starting this blog. What values are motivating your engagement, and how are those values affecting the public statements you plan to make? It is perfectly acceptable to advocate. We are citizens, we have every right to express our views. However, if we are not clear with people about when you are making a scientific or “objective” judgement (i.e. our analysis shows climate change will lead to an increase in coral bleaching) versus a value judgement or a “should” statement (i.e. we “should” reduce greenhouse gas emissions), then we are only doing harm to the overall scientific enterprise. When James Annan honored me with the award, he, like most of the past several years of recipients, was focused on the Thinking Blogger part, and I’ve certainly tried to live up to that expectation, both before and after being officially designated a Thinking Blogger. What’s more, he was following in the footsteps of his predecessor, the charming and insightful John Nielsen-Gammon, who suggested that the award go to earth Science bloggers who think critically and hope for a better world through better education and an honest media. But as someone who actually has a world view on which Woody Guthrie has a large impact, I was faced with a second constraint, that of rewarding the original and obscure intent of the award, which obviously had something to do with, well, Woody Guthrie. And like anyone else there is only a smallish number of bloggers that I catually follow regularly. I can’t keep up with my RSS feeds, and I get plenty of leads on things to read from social media. The quest for somebody who would both meet John’s criterion and do justice to Woody Guthrie’s memory presented me with a quandary that I described in a recent article here. Really, I wanted someone with a folk ethic, someone who could speak for the human spirit of a time and place. It’s really damned difficult to come up with a scientist who’s in touch with folk wisdom and writes and communicates about it in a spirit of respect and empathy. Simon may well be flattered that I think of him in both groups. But now he is saddled with finding someone else who fits the bill over the next year. Good luck, Simon, and thanks for all you do. 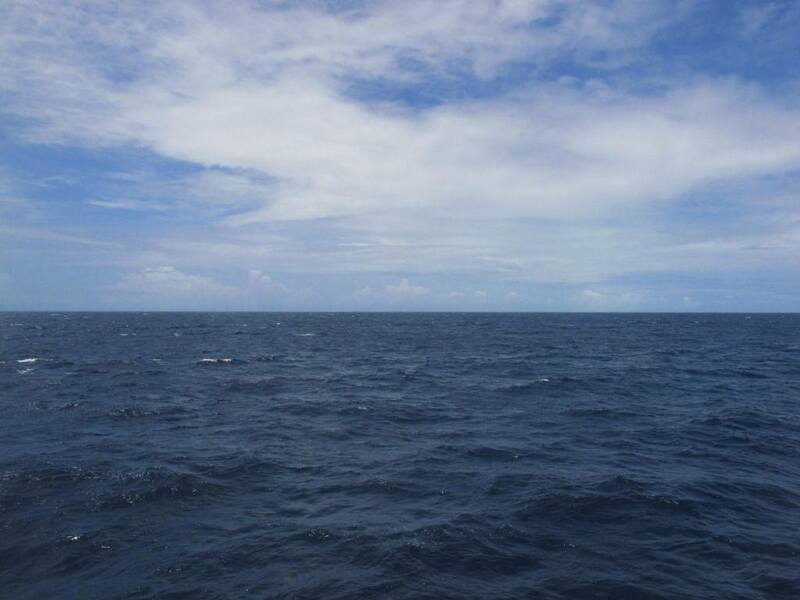 After a rough night on the open passage from Butaritari, where the winds have 1000s of kms to stir up a good well, there was much excitement when Tarawa first appeared on the horizon. That’s it in the photo. Don’t see anything? The old i-Kiribati mariners, and many fishermen today, navigate between the thin, flat atolls by looking at the clouds. The shallow lagoons of the Central Gilberts shimmer an amazing greenish-blue. That green can often be seen reflected in the low clouds. It’s fairly easy after a bit of practice, especially if you have a pair of polarized sunglasses. The reflection is only one of the many tricks for navigating in this flat part of the planet. The cloud formations themselves are a good key, as are the currents, the birds and possibly also the fish, if you’ve got a line in the water. Wow. I was probably trying to figure out compiler switches in some new Fortran compiler that day. Maybe Simon just has better material to work with than I do. But anyway, he’s always well worth your attention. So here, Simon, is the somewhat hideous homemade graphic scratched together in the depths of internet time by who knows who, that goes with the award. (For those who don’t recognize it, it’s a photo of Woody Guthrie’s guitar.) Paste it and enjoy such glory as it brings. Thanks for taking the torch, Simon, and may you pass the award on wisely. And if you can, spare a thought for Woody some time in between. That is a fine choice! I'm having an enlightening time catching up on Simon Donner's writings and work. Highly edifying, great choice. Thumbs up from another Simon fan and friend! Thanks for adding quality and thoughtfulness to blogging!! I'm still struggling as a layperson with small claim to scientific expertise, except for a vast acquaintance with scientists in a variety of venues, as to how to correctly present the undoubted reality of physics and climate change without being able to do the science myself. I can see in some of the above-referenced material a suggestion that I should just shut up and leave it to the experts, but I don't believe that's the answer; there aren't enough of you, and your perspectives and contacts are limited. I know from teaching drawing that students did not want to hear about my self-doubt, but authority must come from a firm base. Many years ago I was told I suffered from a "failure of expertise". It's one of those doubtful arenas like religion. The "trick" (hah!) of not straying from my own knowledge is central. 'gaseous tetris' approach to explaining the greenhouse effect might be funny... get a roomfull of people and give them a bunch of gym balls. the amount of gym balls should be a little over double the number of people. then tell them to hold the balls and ask them to spin. then throw in more gym balls (a third of the excess above two/person) and ask them to do the same. look how much more they stumble and produce heat. the trouble with this approach is of course that the amount of required gym balls is pretty large ;-). Thumbs up from the peanut gallery, too. What I particularly like about your choice is that it not only recognises what is obviously already a valuable contributor but it raises the profile of someone who doesn't yet look to have received the attention he deserves - though I'm sure many will be more aware of Simon than I've been. "Inability to attribute events to climate change may make adaptation seem impossible. A solution is to not view adaptation as separate from other development activities. For example, the large aid institutions recommend marrying climate change adaptation and disaster risk reduction. In other words, when working on a program or system to reduce future droughts, consider how climate change may alter the likelihood and nature of future disasters." Thanks for pointing that one out. The use of quotes from scientists being honest to discredit reality is one of the many pestiferous tentacles of the denial bag of tricks. Attribution is so difficult, that any layperson can see what scientists are not allowed to say, hat there is a connection with climate change and a lot of current conflict. The ominous acceleration, evidencing dangers long rising to a boil, is still being exploited for doubt and delay.